COMPASS Wealth Management, LLC provides you with a wide variety of wealth management services through our comprehensive program, Wealth Management Solutions, at a very competitive rate. Wealth Management Solutions integrates your ongoing investment and financial planning needs into one customized program. As your circumstances change, we adjust our recommended strategy and implement changes to your investment program as appropriate. COMPASS manages your assets primarily on a discretionary basis; in other words, you allow us to make purchase and sale decisions on your behalf. Please be assured that your discretionary assets are held by a leading third-party custodian. COMPASS has no authority to withdraw money from your accounts without your written authorization. 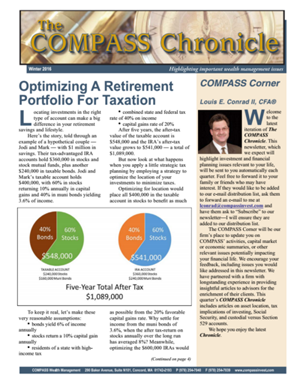 As an investment advisor, COMPASS receives preferential, institutional treatment, which benefits you with broader mutual fund selection and lower pricing. We can select from thousands of mutual funds, including many with an institutional share class that offer significantly lower expenses. As a client, you will also receive monthly investment statements directly from the custodian, as well as confirmations of transactions performed on your behalf. In addition to managing your portfolio, Wealth Management Solutions also includes our suite of financial planning services for no extra cost. Our most popular services are listed in the left margin.